Many times, I’ve whined about the fact that even though my blog is approaching 10,000 views this year alone, very few readers feel the need to leave comments. But here’s one post I’m really hoping people respond to, especially since it concerns a question I don’t have an answer to. 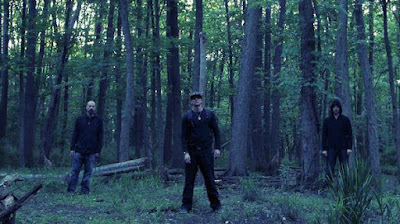 To put it bluntly, I can’t figure out how the heck Ghost Adventures managed to get permission to investigate inside Bachelor’s Grove Cemetery at night. For the uninitiated, Bachelor’s Grove is an abandoned cemetery located on the Southwest side of Chicago. Early records are sketchy at best, but it is believed that the first burials were in 1844. For many years, the cemetery, which sits within the Rubio Woods Forest Preserve, could only be reached by a small road that wound its way through the woods. When the road closed down, the woods would have all but swallowed up the cemetery, had it not been for the teenagers who started making their way out there to do a bit of legend tripping. By the 1960s, the cemetery had already begun to fall victim to vandals…and the ghost stories were not far behind. Today, Bachelor’s Grove Cemetery is considered by many to be one of the most haunted places in the United States, if not the world. It’s not uncommon to find the cemetery sitting atop numerous “Top 10 Most Haunted” lists, due largely to the staggering amount of reported ghost sightings said to take place here. In addition to your standard ghostly figures, there are also reports of ghost cars, a ghost horse, and even a ghost house. And the sightings have spread out so as to not just include the cemetery, but also the surrounding woods. The nearby pond is even said to be haunted by the ghosts of “Mafia victims” who were unceremoniously dumped there. With all these ghost stories swirling around this little cemetery in the woods, it’s easy to see why Bachelor’s Grove, for several decades now, is considered a popular destination for people to look for ghosts… or just get drunk and scare the heck out of each other. I’ve personally been visiting the cemetery on and off since the late 90s and have yet to go when I didn’t either bump into people there or else find remnants of their visits (usually in the form of snack wrappers and beer bottles) along the way. The cemetery’s part of the Forest Preserve, so it’s open to the public during the day. But like most cemeteries, it is closed from dusk until dawn. Of course, nighttime is when most people try to get inside the cemetery. And that’s something the locals simply don’t stand for. 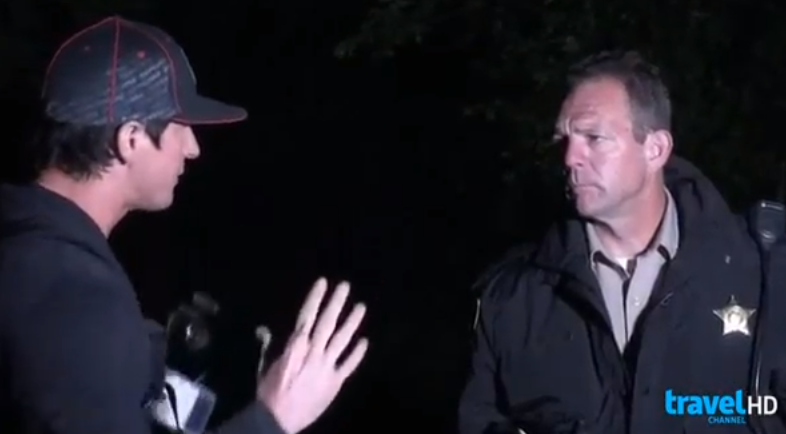 You see, for as long as I can remember, stories of ghosts in Bachelor’s Grove Cemetery have gone hand-in-hand with reports of people being arrested and/or ticketed for trying to get into the cemetery after dark. Even today, the area is regularly patrolled by both the local police and the Forest Reserve. I don’t know if it’s because of the repeated vandalism in the cemetery or just because they have grown weary of running thrill seekers out after dark, but I’ve met more than a few of the men and women who patrol the area and they all have one thing in common: they don’t care who you are or why you’re there. If it’s after dark, you’re at least getting ticketed. End of story. I’ve also met numerous individuals and organizations who have tried to go through the proper channels to get permission to investigate and/or film there after dark. The response has always been the same: “no”. A few years back, I even tried to interview some of the people who patrolled the area to see if they had encountered anything ghostly. The only response I was given was that “there are no ghosts there. Just an old cemetery.” Clearly, authorities are wishing the ghost stories, and to some extent the cemetery, would just fade from public view. Which brings me to my big question. Last Friday, I’m flipping through the channels and I seeGhost Adventures is on. I don’t normally watch the show (or any other ghost reality show), but whenever I flip past an episode, I always stop for a moment just to see if they are investigating anywhere cool. And my jaw dropped when I saw that not only was Ghost Adventuresinvestigating Bachelor’s Grove Cemetery, but that they were the first group given permission to film inside the cemetery after dark. How is that possible? And of all TV shows, the first one allowed in is Ghost Adventures? Let me pause for a moment to publicly announce that I am not trying to turn this into a Ghost Adventures bash-fest. Trust me, I’m still dealing with the emotional scars from the last time I said something less-than-flattering about Zak Bagans and incurred the wrath of GAC–the Ghost Adventures Crew. The point I’m trying to make is that, love or hate the show, everyone would have to agree that if Ghost Adventures is filming an episode, they are going to find something ghostly. And that when they find it, the results are going to be very dramatic and over the top. 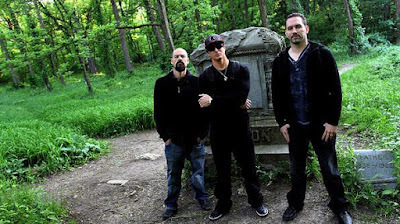 I’m not saying that’s right or wrong, merely that I have not seen an episode ofGhost Adventures where they walked away without finding any evidence or they ended up declaring a place not to be haunted. And that’s what’s got me scratching my head. Why would a location that is clearly trying to keep people out at night and downplay the ghost stories turn around and allow themselves to be featured on a show whose premise is “we find ghosts in the middle of the night”? And right before the height of the Halloween season kicks off and the whole US starts getting ghosts on the brain? 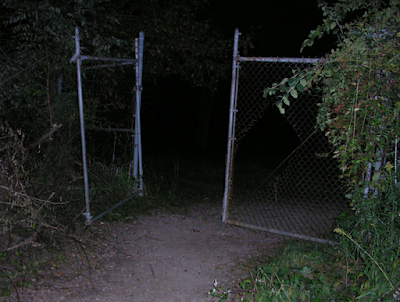 They had to realize that once the show ran, hordes of people were going to descend on Bachelor’s Grove and try to sneak in at night–the very thing they are trying to prevent. Case in point, Ohio University recently revealed that they would be demolishing one of the “haunted” structures at the university-owned Ridges, the former Athens Mental Asylum. They’re knocking down the building that once served as, among other things, the TB Ward, because it has become unsafe to enter and yet people still keep trying to get inside to explore it. And they want it knocked down before Halloween. Translation; we’re erasing this “haunted” building before this year’s influx of Halloween thrill seekers because we’re tired of chasing them off the property. So could the owners have opened up the cemetery to Ghost Adventures to get themselves more publicity and/or exposure? Doesn’t seem too likely. As I mentioned, Bachelor’s Grove Cemetery is already well-known. Besides, getting more exposure on a ghost reality show, especially one filming at night when the cemetery is closed, would seem to be something the owners would want to avoid at all costs. You could perhaps argue the point that the owners thought the show would debunk all of the ghostly claims. But again, that’s not what Ghost Adventures is about; the show’s more about validating the claims of ghosts. Sure, they might find a rational explanation for a thing or two along the way, but by and large, they’re going to find ghosts. So it’s not like a National Geographic-type documentary was going to take place. I thought for a moment that maybe Ghost Adventures or their production company threw a massive pile of money at the Forest Reserve to gain access. And while that certainly might have happened, I don’t think money could have been enough to make them break down and let people in, especially since it doesn’t change the fact that thousands of Ghost Adventures fans would be descending on the cemetery as soon as the episode ran, creating the need for even more patrols through the area. I’m sure that would go over real well with all the officers and rangers whose unofficial job is to keep an eye on the cemetery. 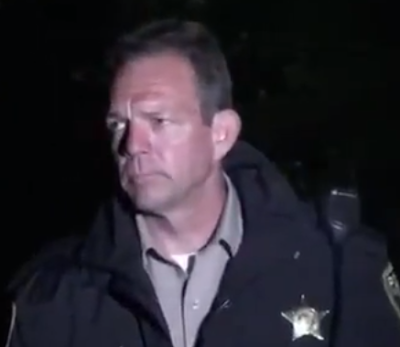 I mean, just take a look at Sergeant Joe (his last name is never given), one of the only officers to appear on camera during the entire Bachelor’s Grove segment. Doesn’t he look just so happy to be there? See that look he’s giving Zak? That’s Sergeant Joe’s famous “I’ve heard your ghost story a thousand times before. You’re not supposed to be up here at night. Here’s your ticket. Have a nice night” stare. So riddle me this, Batman: what happened to allow Ghost Adventures night access to Bachelor’s Grove Cemetery? I’m all ears and really look forward to your comments because I’m clueless as to how and why it happened. And please, I’m not interested in making fun out of the show–I’m more interested in your thoughts as to why the cemetery let them in. 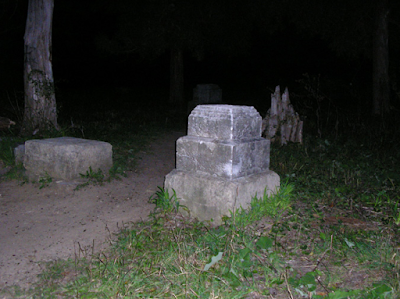 Read more about the haunted history of Bachelor’s Grove Cemetery at Troy Taylor’s Ghosts of the Prairie, located here. For everything you ever wanted to know about the history of Bachelor’s Grove Cemetery, visit Bachelors Grove Cemetery & Settlement–Research Center. You can even read a brief overview I did on the cemetery, along with a few pics, at The Ghosts of Ohio page on Bachelor’s Grove Cemetery.